This just went up at Kennedys and King. I put a lot of new and interesting info into this one because its a fascinating subject concerning both the alt/right, and Fred Litwin. One would think the alt/right would be all over the JFK case. But as far as Claire Lehmann who allegedly edits Quillette that is not the case. Which really makes me wonder about the whole phenomena. Anyway there is some new info in here also. Every opportunity I get to go after Fred,I will. I just explained, in the Clay Shaw thread, why I am replying to you in this thread. 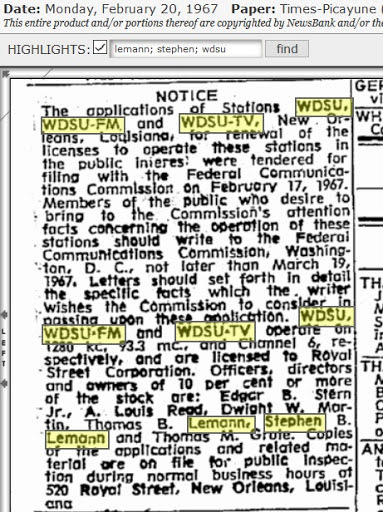 Less than three years later, Lemann is occupying a desk next to Tom Bethel's at the Washington Montthly. Mar 23, 2007 - Tom Bethell, dismayed by media coverage, traveled back to the beautiful and ....Later, I would go uptown to see Brown, who is a part-owner of the Maple Leaf Bar, a prominent venue for live music. But as a preliminary step I paid a call on an old acquaintance, Thomas B. Lemann , a lawyer well known to the city’s establishment. . ... the consumption ofoystersnow requires a trek into the French Quarter. American Enterprise Institute, LOL, of all places? Jim, my ardent belief, based on the facts as I have come to know them, is that Garrison "mugged" Ms. Mellen, you, and Zachary Sklar. you have a megaphone, to your credit, while I am akin to the (Trumpian) 400 lbs. guy in his pajamas on a bed in his mother's basement. 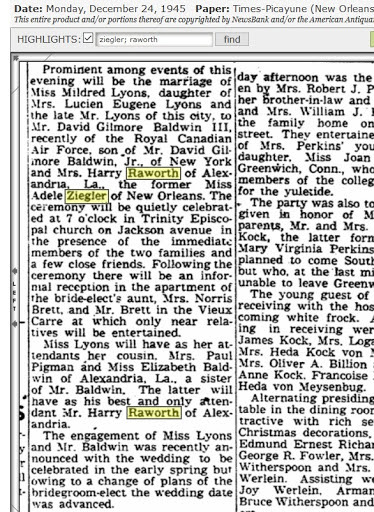 to decipher the Baldwin Lemann Garrison conundrum, especially because they are all family and Garrison was not known to have pointed that out. David Baldwin did, andthe first known person he communicated it to was his friend and former employer Clay Shaw, in immediate reaction to Shaw's arrest. were toasting Baldwin/Shaw pall and later CIA guy, Jesse Core and his fiancee, Lucy Ruggles in that same Turtle Creek house. former long time visitors or residents of India, all via State Dept., CIA, scholarly, or journalistic assignments. Thornley testified that this mentor BOLTON, formerly with the AP in India, visited Core and invited Thornley to accompany him. The movement Lucy and her two friends were described in a CIA report as participants was led by....Mac Wallace. the person passing out leaflets with Oswald near the Trade Mart. Dave Lifton and Kerry the Great (ask him) Thornley. In all of this biased ... lated to the charge of perjury against Thornley, there is .... that Mentor Bolton also rec. Last edited by Tom Scully; 12-05-2018 at 09:36 PM. The sound of one cricket chirping again, Tom? Always a pleasure to read anything about Kerista !!! Thanks for posting. Enjoy the Festivuses!! And that is not all. 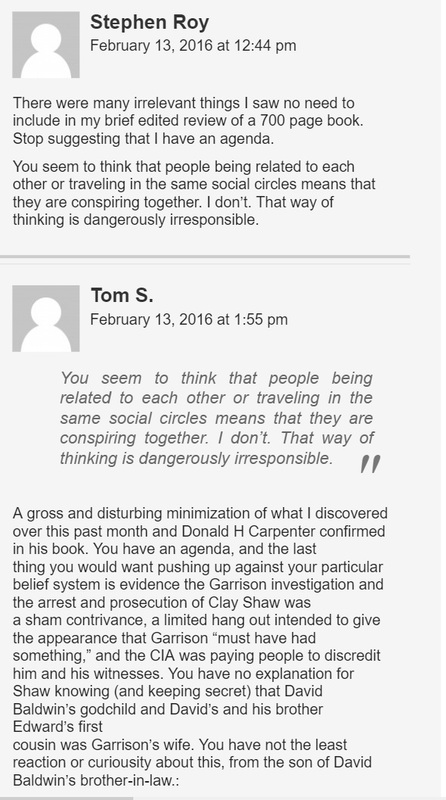 Carpenter ignores the cover up within the CIA about Shaw's contract agent status. That cover up was ongoing into the nineties. In fact, the ARRB discovered that it was so deep that the CIA destroyed Shaw's 201 file. (ARRB memo from Legaspi to Gunn, 11/14/96) This was all begun by design in the summer of 1964, and I have this through a letter that Gordon Novel wrote after the Garrison investigation, namely that the CIA Office of Security ordered a cover up about Shaw's true Agency status a that time. Why? And why did it never end? Why did Shaw lie about knowing Ferrie, Oswald, or being in Clinton/Jackson, and using the Bertrand alias? To quote the late attorney Allard Lowenstein, "In my experience, people with noting to hide don't hide things." In my view, there are not a lot of people who you can make a better case against today for complicity in the JFK case than you can with Clay Shaw. The other point you once brought up, which I assume you also got from Carpenter, since I never heard you express it before, is just as ersatz. That somehow Garrison's inquiry did not cost him anything. Again, please. In 1966, Jim Garrison was ascending very fast to becoming one of the most popular and powerful politicians in the state. He had made headlines--some national-- with his crusade against B girl drinking in New Orleans. He had gotten Governor John McKeithen elected, even though he was a second tier candidate. He confided to a pal at this time that the only other job he really aspired to besides being DA was senator. It was his JFK inquiry that cost him both of those jobs. When someone blows his career ambitions over a case, then how can anyone say that he did not lose anything? But it was worse than that. When Connick put together a huge campaign war chest to defeat Garrison in 1973, Garrison had just been through two criminal trials on corruption charges. I can tell you right now that neither of those cases would have ever been brought if not for Garrison's investigation of JFK. So in addition to losing two careers, he almost went to jail. But there is actually more. 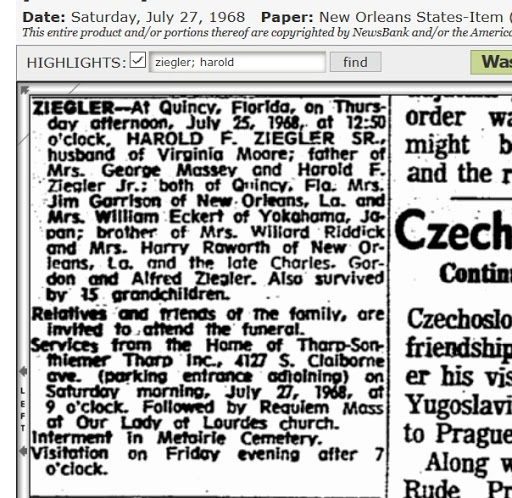 Once Connick defeated him, and because the power elite in New Orleans had now disdained him, Garrison did not get any job offers, as he had been able to do before the JFK case. People who talked to him at this time said he was renting a small office from a larger law firm. They said he was personally kind of bitter about the whole thing. Does Carpenter say this was all an act? Including the two trials? But there is still more. See, Connick, who worked for the Justice Department to defend Shaw, ended up being an absolutely terrible DA. One of the worst in the nation. He was so bad that he was actually singled out from the Supreme Court twice for malpractice. When i asked John Volz, who worked for both men, to compare the two he said there was none. Connick was a disaster as DA. So it was not just a cost to JG but also the city of New Orleans and also the people who Connick used every unethical track with in order to get a conviction. Look it all up if you don't believe me. So just what in Hades is Carpenter talking about? As I said, a friend of mine told me that he knew what Carpenter's agenda was from meeting him just once. We don't need any of that anymore in this case. That kind of cover up crap has wielded a lot of damage. Falling for Carpenter? Or falling for you, Jim....... the truth will out+ .......... but not in our lifetime. sigh. If you read my review of Carpenter's article you will see how I show that Carpenter did not use the declassified documents in his book. Therefore, he was concealing important information from his readers about his main subject. As I also mention, he was also not candid about General Thrasher's career and Shaw's service with him. Then there is the matter of the destruction of Shaw's 201 file which the ARRB discovered in the nineties, along with the hidden contract agent status the man had. These are all provable and important facts which Carpenter does not alert his readers to. Having a laptop power issue...will post a serious addition to this reply below the quote box late tomorrow. In.the meantime thought provoking (I hope...) prank. this in his book. I discovered the review of the book by David Blackburst on Holland's website. Shaw seems to have kept that to himself. Several days later, I learned Mr. Blackburst had passed. at the Stern's upstate NY estate. I no longer see continuity in the Garrison Investigation debate.For example, Jim, what would you say to Nicholas B Lemann in a debate, considering his family ties? 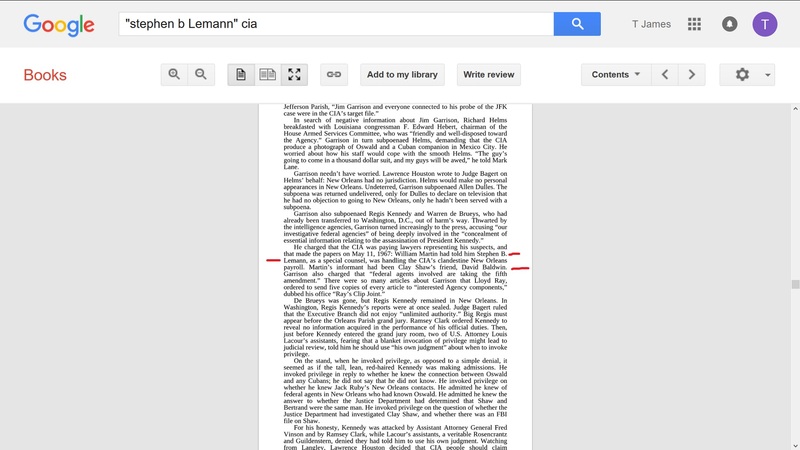 Stephen B Lemann's brother is Thomas Lemann, father of Nicholas B. Lemann. The stepmother of Stephen and Thomas Lemann was Mildred Crumb Lyons Lemann. Her daughter, also named Mildred Lyons, was stepsister of Stephen and Thomas Lemann after her mother married their father Monte Lemann in 1947. Unredacted Episode 1: Transcript of Interview with Joan MellenJoan Mellen is the author of A Farewell to Justice: Jim Garrison, JFK’s Assassination, and the Case That Should Have Changed History. This interview was conducted on 22 Feb 2006.
concealed by both Garrison and Shaw, and by lack of disclosure of Nicholas B Lemann. …the New Orleans’ firm Monroe & Lemann. Partner Stephen B. Lemann has been alleged by JFK theorists to have been chief over all New Orleans-based CIA operatives. Monday 12/30/1991Journalist Nicholas Lemann, movie critic David Denby, and co-screenwriter Zachary Sklar debate Oliver Stone's movie "JFK"
as well as the facts surrounding the assassination of President John F. Kennedy. 03:14Nicholas Lemann: .....in this case, what the movie is really about, the center storyof the movie, the star who's on this screen the whole time isKevin Costner playing Jim Garrison.I am a non-fan of Jim Garrison.Jim Garrison did the worst thing a public official can do, whichis use the power of the state to take a man who was innocent andwho I think he knew was innocent and put him ontrial, charge himwith a crime to make a larger point about society.That's exactly what Joe McCarthy did andwitch hunters throughouthistory did. 04:30Charlie Rose: And if you were doing that, how can you tell the truth? Here's a man who's a reporter from--04:37Zachary Sklar: I don't agree with what he just said.04:39Charlie Rose:That Jim Garrison put Clay Shaw on, knowing thathe did not have the facts to convict him? Last edited by Tom Scully; 12-17-2018 at 10:22 PM. "They" still don't get it, do they, Tom? What hath Oliver wrought? And why is his progeny over on the RT side? 2019 shall be the year of the cyberwars. But you didn't hear it from me, see? skinned, revised price of participation there is beyond the pale. Here is a link to the image of the original, summary execution warrant....just to refresh your memory! I perceived I had made with Andy Walker. I learned the hard way as to the strength of commitments made by Simkin and Walker. when I would have expected you to be the last person I would have to communicate, with such mixed feelings, a lament such as this!